These Gymnastic rings are an essential piece of your functional and fitness training routine, which you can use to improve all your gymnastic movementss. 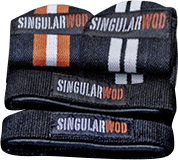 Manufactured with phenolic birch wood, these Singular WOD Gymnastic rings are resistant to sweat and chalk. Their 5-meter nylon straps with safety closure allow you to adjust the height of the rings in a few seconds and the Velcro straps ensure any excess length won’t bother you while exercising. They are manufactured in structural steel and have a stove-lacquered powder paint coating. Test their stability. They can withstand anything.